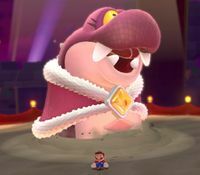 The pink variant of Hisstocrat appears as a boss in Super Mario 3D World. She serves as the boss of World Bowser-B: Hisstocrat Returns, and reappears alongside Hisstocrat as two simultaneous bosses in World Flower-12: Boss Blitz. She fights very similarly to Hisstocrat, where the only difference is that she rains fireballs instead of boulders upon emerging from the ground, which leave temporary fiery puddles the player must avoid. She also spits fireballs as well. As Hisstocrat, she sends up fuchsia-colored snakes, several of them holding plates. A Super Bell can spawn on a plate, giving players opportunity to transform into Cat Mario in order to climb up the snakes to stomp on Hisstocrat. In the Boss Blitz version of the fight, both Hisstocrats have fireballs raining down, and when one Hisstocrat is hit, the remaining Hisstocrat pauses and cries, giving the player an opportunity to strike that one as well. ↑ Musa, Alexander, and Geson Hatchett. 2013. Super Mario 3D World Prima Official Game Guide, pages 197, 269, 270, 271. This page was last edited on March 20, 2019, at 15:46.